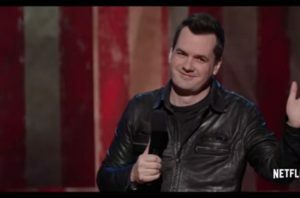 Jim Jefferies: Freedumb special on Netflix is comedian Jim Jefferies latest comedy special – that is a stupid sentence but Google will love it. As so many stand ups are doing nowadays, this is a Netflix original – if you arent subscribed the Netflix what i wrong with you – it is 2016 for goodness sake. You need to be binge watching TV and watching all of the latest comedy specials. All of this has come off Wikipedia, if it is wrong I blame Jim Jefferies or his people. Jim Jefferies is an Australia comedian, actor and writer. Jefferies tours the world doing stand up but has also been in the low budget Australian zombie film: Me and My Mates vs the Zombe Apocalypse and his TV show Legit. By far is largest acclaim is his stand up but he has recently become known for his stand on gun control. 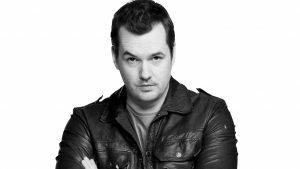 You can learn more about Jim Jefferies and find him on tour at his official website. I love Jim Jefferies. He is funny as hell and his stand up is very personal. He opens this special with stories about his life and the new addition to his life, his little boy. From vaccinations to potty training he pokes a little fun at his life and really connects with the audience over things that everyone finds challenging and many, those with kids, have experienced. Hard discussions over autism, raising your child those day to day fights that you might have with your significant other. From this common ground, Jefferies take a quick turn into more serious matters. He admits that love doesn’t always beat hate but I think it is a good idea. He also admits that he gets death threats and emails about his political beliefs, and whether you agree or not you have admire him for getting out their and using his platform wisely. He is equal opportunity with his jabs and barbs. He doesn’t mind pointing out the flaws in arguments and beliefs. His brilliance shines through – more on this in a minute. Anyway, great special! 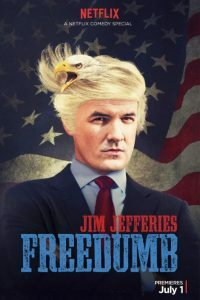 Jim Jefferies is one of my favorites. As I always say, comedians are the smartest people working in entertainment. Jefferies is no exception. is self deprecation really takes the edge off what he says but what he says sticks with you. One of the last pieces on this special is on freedom – hence the name of his special. Lots of knowledge being onloaded on an unsuspecting audience. And they loved it! Not for nothing, but he spins back around to something a little more superficial at the end of his set. Again, genius. He throws some truth at the audience a d then brings them all down with a discussion of the beauty rating of the people around the world. Leave those that have the ability to have their mind changed guessing. I would love to know if he got some converts out of the night.